Increased immune activation in HIV– Ugandans. 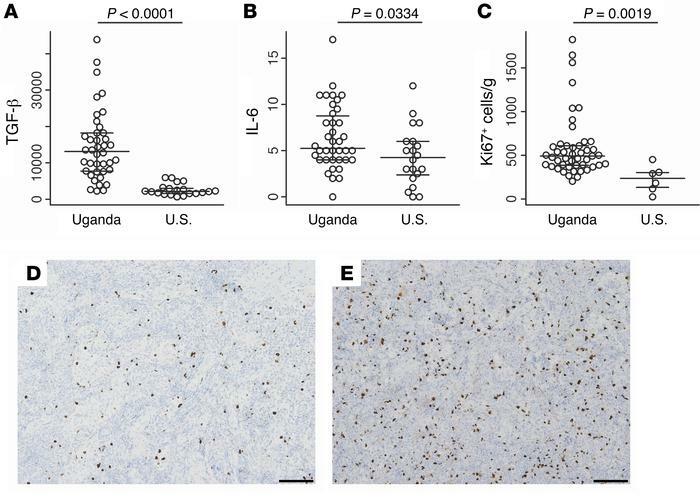 Prevaccination plasma samples demonstrated elevated levels of TGF-β (A) and IL-6 (B) in a group from Uganda compared with a group from the U.S. LN sections stained for Ki67 also demonstrated increased immune activation when compared with LN tissues obtained from people in the U.S. (C). Representative sections of LN stained with Ki67 antibodies from an HIV negative person in Minnesota (D) and an HIV negative Ugandan (E) are shown. Scale bars indicate 100 μm and magnification is ×10.